As a sporting event planner, how do you keep up with the trends of the ticket buying public, sponsorship and merchandising while at the same time attending to the hundreds of management and operational details required to execute the event? A successful sports event requires a planner that can read signals from their market and plan strategically to maintain sponsors and a fill an arena. 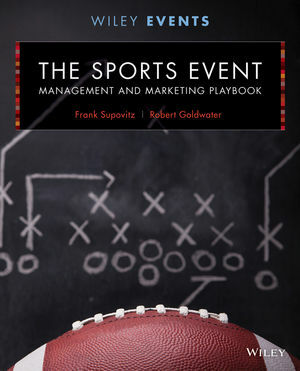 Frank Supovitz is the author of The Sports Event Management and Marketing Playbook, 2nd Edition, published by Wiley. New and updated charts and figures to ensure that every detail is considered before the gates open and the score clock begins its inexorable countdown. Updated Sideline Stories include more current real-life anecdotes from the field that were a favorite feature of the previous edition. These stories provide vivid examples of best practices, as well as plays that were proven best to avoid. Updated Post-Play Analysis chapter summary sections and Coach’s Clipboard review questions reflect new content per chapter. An expanded section of useful forms, sample documents, and checklists that can be accessed in the appendices at the end of the text. Provides a broad, comprehensive overview of how to begin visioning, planning, funding, and ultimately producing sports events. Stories from the Sidelines give professionals and students real life examples of the development, management and execution of sports events. Coach's Clipboard feature questions and thought-provoking intellectual exercises designed to build confidence in the student by applying the lessons of the chapter to hypothetical situations. Practical checklists, tables, figures, and forms included in each chapter.